Who am I and why am I organizing? I have been organizing “things” since childhood; my brothers’ trucks, my pretty stones, and especially my mother’s cupboards. Those cupboards were probably formative in my appreciation of people’s collections and memorabilia. And they taught me the important difference between collections and clutter. But sharing a bedroom with a very messy sibling probably triggered my initial quest for order. As an organizer, I’ve seen far greater degrees of clutter, but I know from that personal experience that diverse “organizational” styles can have a big impact on family members. By the time I left home for college, I’d learned how to set up an effective homework and study zone that worked for me. Now I understand why each of us has unique needs and preferences when it comes to our living and working environments. I take special care in finding out what will work best for my clients and their children to learn and play and rest. Acquiring a Bachelor of Arts with a major in art and psychology wasn’t a very strategic career pursuit, but in retrospect it has served me very well. In spite of my best efforts to simply enjoy life, I learned a lot of organizational and problem solving skills working for some very successful companies. Among them: Rock Resorts, Hawk Mountain Corp., The American Academy of Ophthalmology, Booze Allen & Hamilton and Montgomery Securities. Leaving the corporate world I went to work for myself doing event planning, catering and eventually film/photo styling. The constant demand for creative solutions, aesthetic judgment and physical endurance were challenging, stimulating and more often than not - really satisfying. What I learned in all those offices and kitchens, I share with my clients! In 1998, I stumbled into this work while doing something else fun. I always heard “do what you love and success will follow.” As luck would have it, I simply helped a relative get her cluttered, overstuffed house sold in four days. That’s only remarkable because it had been on the market for six months without an offer. In six hours, my shang-hai’d team of three de-cluttered and rearranged and purged. It became a totally different home. It was beautiful, stylish, functional and sellable. It was also--almost ready for the move. We purged so much unwanted stuff and packed up the excess to prepare for the sale, so the move felt simple. The results were so successful that I got addicted to making houses look their best. And in the process discovered how much more functional they were. Often my clients liked the results so much they didn’t want to move. So I started helping people make their homes look and work better. I made it a goal to give my organizing clients the same experience of loving the way their home looks and functions. I quickly found The National Association of Professional Organizers (NAPO) and then the Institute for Challenging Disorganization (ICD). They provide professional development, a certification program and a great network of colleagues with whom I share resources. In April 2007, I was one of 150 organizers worldwide who passed the exam of the Board of Certification for Professional Organizers earning CPO status. I continue to pursue learning and teaching opportunities, dedicating myself to offering the highest level of organizing service and consulting. Helps adults with Attention Deficit/Hyperactivity Disorder (AD/HD) lead better lives by bringing together science and the human experience for both adults with AD/HD and the professionals who serve them. A group of about 20 local volunteers who fund raise to provide caretaker hours for a young quadriplegic bankrupted by her illness. 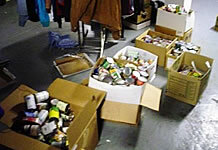 Construction Captain for a remodel and reorganization at Larkin Street Youth Center Facility’s basement. Organizing consultant on projects for three private home renovations and one public school. A jumble of crowded, unsorted clothing made it difficult to find sizes at the Larkin Street Youth Center. After engineering the installation of heavy duty plumber's pipes to serve as hanging bars, long rows of double hung clothing were sorted by size and color--just like a department store. 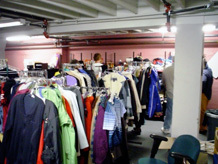 The increased hanging space got things out of boxes on the floor and provided more clothing options for the youth being served at this agency. Sept. 2013 Celebrating Inattention: ADHD, Neurodiversity & Multiple Intelligences, by Thomas Armstrong, PhD. On October 6, 2007, I was on a panel of organizing experts at the ADDA’s day-long Regional Conference in San Francisco. Each of the panel participants have successfully worked with clients challenged by ADD/ADHD. Our goal was to demonstrate that AD/HD people's "creativity" is often both the cause and the best solution to their clutter and chaos. On October 27, 2007 the National Association of Professional Organizers’ San Francisco Bay Area Chapter offered a day of workshops to improve skills and resources for its members and other professionals providing organizational services to the public. I taught a workshop at this conference. On behalf of Larkin Street Youth Services’ staff, Board of Directors, and most importantly - the youth we serve, my deepest thanks to you for your time and dedication to improve the Drop-In Center. 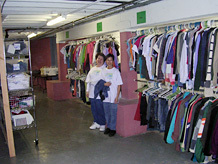 In just two days we were able to clean, repair, paint and completely re-organize the Drop-In basement to create an infinitely more usable space for our Outreach Department and Clothes Closet, while also providing extensive storage. What was once a cluttered, inefficient, and poorly-lit area has become a clean, organized and multi-functional space. From all of us, a huge and heartfelt thank you.